Moving right along here in our Tips for Brides series, we now get to the fun part, the shooting! The first scheduled session in your photography calendar will be your Save The Dates. Save the Dates are your first opportunity to introduce your wedding to your family, friends and soon to be guests. You want to make it personal and show off your uniqueness as a couple. If you don’t have a creative bone in your body, don’t fret. Use your photographer as a resource for ideas. A lot of times, your photographer will just need to ask you some questions about who you are to try and find out what might make a good representation of the two you in a picture. Now for some people, the Save The Dates session and the Engagement session will be merged into one photo shoot, which is an excellent way to save some money if that’s concern for you. Whichever route you take, you’ll first want to consider a few critical elements. Timing is extremely relevant when you are planning your photography calendar. Timing will affect when you can send out your Save The Dates. Timing can change the look and feel of your Save The Dates. And lastly, timing can change how you use your Save The Dates. Typically, a Save The Date will be sent out 6 months before the wedding. Of course, there are no hard or fast rules regarding Save the Dates, but the purpose is to give your guests fair notice and warning so they can plan for it. Some weddings may require guests to travel; some may be held on a popular vacation weekend such as the 4th of July, Memorial day Weekend or Labor Day Weekend. Sometimes, the wedding is near a holiday, such as New Years Eve or Valentines Day, in which case your guests may make other plans fairly early on. So a 6 month lead time is the unwritten rule of thumb. Quite often, we’ll meet with a couple who recently became engaged and are planning their June Wedding. It’s now July, and they want their engagement pictures to be full of spring flowers. And they want to use their engagement session photos to create a Save The Date. The problem is that when Spring rolls around, it will be a chance to send out the invites, not the Save The Dates. So you have two options. Either plan a separate Save The Date session for the summer or fall so you can send them out soon, or be flexible with the look and feel of your Engagement pictures. Either way, just make sure you discuss your options with your photographer. Will it be a magnet or a card your guests can pin on their fridge? Will it be a video montage that is emailed to guests as a link? Will the pictures captured during your Save The Date session be used on your wedding website? Will the images be designed into something creative and unique that you and your fiance came up with together? Whatever your ideas for the Save The Dates are, make sure you let your photographer in on that. This will help your photographer to shoot with your vision in mind. If your design requires a vertical image versus a horizontal shot, that’s something your photographer will need to know. And as long as we’re on this topic, make sure you and your photographer understand exactly what the photographer’s role is in creating the Save The Dates. Are they just taking the picture or are they also designing the Card/Magnet/Video? Most photographers will have separate pricing if they are creating the Save The Date in addition to taking the pictures for it. There is no wrong way to design your Save The Dates. It could be just the two of you sitting in a garden where you plan to exchange I do’s later this year. 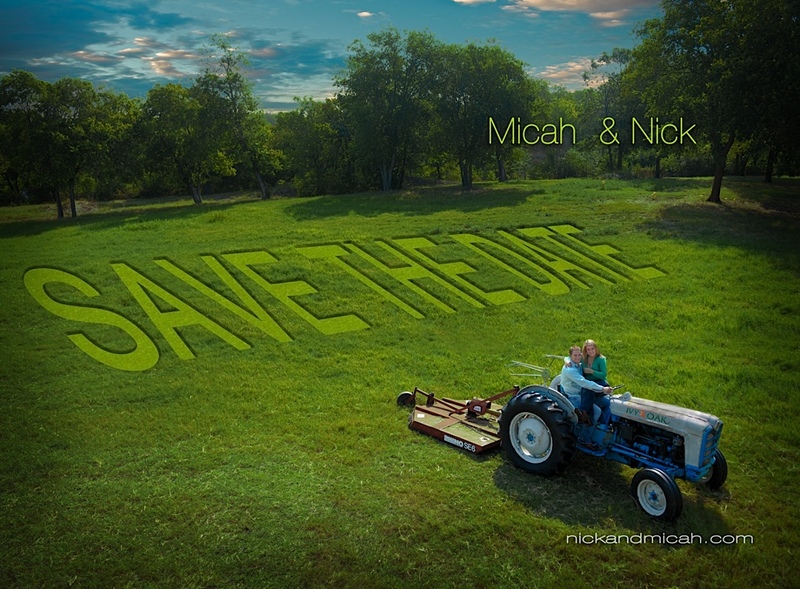 Maybe the shoot is more conceptual, using the surroundings and a few tweaks to make your announcement. For example, when Luke & his wife Bethany had their Save The Date session, they incorporated Bethany’s love of fashion with Luke’s passion for photography in one magnificent Save The Date card. Bethany is sitting on on the bed of an old pick-up truck, her feet dangling over the side, clad in her favorite Christian Louboutin heels. On the edge of the truck they had spray painted “Save the Date” and Luke stood by her side with a camera in hand. It made for quite a picture and represented both Bethany and Luke’s interests. Save The Dates can be done on a budget by utilizing a favorite public location to stage the session and by bringing props from home. You can also go the other way and hire a stylist to set the stage for your Save The Dates. A stylist can help with venue selection, wardrobe selection, hair and makeup, props, scheduling and much more. As we said earlier, there is no wrong way to design your Save the Dates. The most important note to take from these tips is to start a dialogue with your photographer about what you’re looking for and find out what your options are. Oh, and make sure you get the date right on your Save The Dates! Next week we’ll be going over the Engagement Session! Stay tuned.